I just talked whined to my big brother for 40 minutes about Mizzou. Seriously. You've already heard my freak-outs about how much I want to go there, but every day that passes without my knowing whether I'm admitted increases my neuroticism about the subject. That sentence doesn't even make sense. I read it back and thought to myself, "Why would the world's best journalism school admit me when I can't even structure a sentence?" See. Neuroticism. This whole graduate school admissions process has created the perfect storm for my particular flaws. = I am one mess of a grad school applicant. Jack, being the awesome brother that he is, sent me these Calvin and Hobbes cartoons. 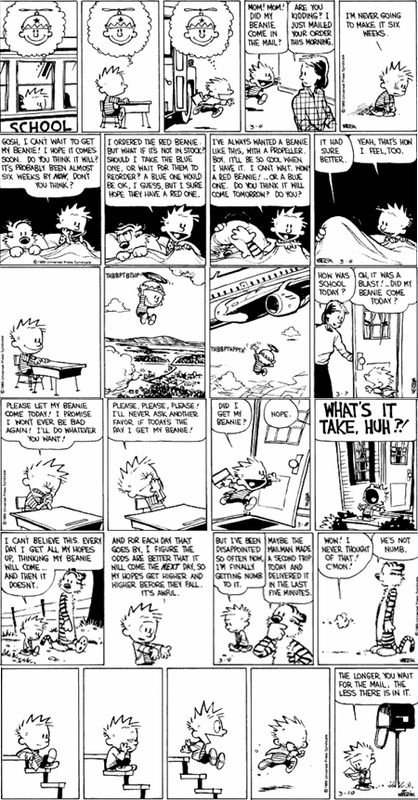 Apparently Calvin and I are the same person. My own personal value is not dependent on whether or not I get admitted to grad school. I will end up with a job. I will. Grad school has no eternal significance. And, again, God has great plans for me.